Adult cats in our Barn Cat Program have no other options and are not up for adoption in our customary adoption process. This program offers these wonderful animals a chance at a safe life that is best for them - they have nowhere else to go and staying caged at a shelter does not help them. We do not adopt cats that are suitable to be house pets to barns, only cats without other options. This is the last chance for these cats; they have nowhere else to go. Since participating agencies do not euthanize for space, these cats can become stressed if they remain in a shelter too long. Upon adoption of a cat, the adoptee must sign an adoption agreement. This agreement states that a cat must be properly cared for (daily food and water and yearly vaccinations), stating the cat must be returned to the agency should any problems arise with the adoptive home. We want to place them in a permanent situation where they can still "earn their keep" and be an asset to the barn owner without reproducing. They can have a civilized environment with human care and other animals for companionship. All cats available for adoption to barns are spayed/neutered and vaccinated. When a barn cat(s) is adopted, agency volunteers will go over how to acclimate the new cat(s) to the barn and make them feel at home. A premise visit is required to ensure a safe environment. An agency volunteer will inspect the barn to ensure it is a suitable environment. After we have determined that it is a good placement, a volunteer will go over with you how to acclimate your new cat(s) to the barn and make them feel at home. Agencies will also conduct a follow-up assessment to ensure that everything is going smoothly with the placement. Agencies do not charge for barn cats, but a donation is very much appreciated. Donations assist in defraying the considerable costs of spaying/neutering, veterinary care and supplies such as medication or temporary shelter. Donations are tax deductible. We ask that you take two or more cats because they provide each other with companionship and snuggle together to keep warm. Like all animals adopted through agencies, barn cats must be spayed or neutered. Usually the procedure will already have been performed prior to adoption. Barn cats are not listed individually on Petfinder.com or other web sites that list animals for adoption. We usually do not allow callers to select the cats they will adopt and we cannot accommodate requests for specific colors, gender or other characteristics. If you are interested in barn cats, please fill out the Interest Survey form. Cats need to be confined initially in their new home for at least two to four weeks in order to familiarize the cats with their new environment, so that they will remain on the premises. Even though there are instances of cats remaining when they have escaped upon arrival, this is rare and most cats will take off, never to be seen again. Other than being dangerous for the cat, this can be traumatic for the rescuer who has usually put a lot of time, energy, money, and care into the rescue. 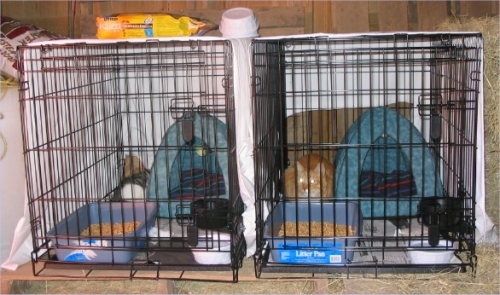 Some people see confinement as cruel, but a short confinement period is a very necessary part of the relocation project. Not confining the cats and having them run off could mean a far worse fate for the cats. During the first day or two, the cats may struggle to find a way out. Most cats settle down in the cage after a day or two when they realize that no harm will come to them. Be careful of dogs at the new home. Although it may not be a problem, the new caretakers should be willing to introduce the dogs to the new cats slowly and not allow the cats to be chased, or they will leave.